Update: Full video now available at link below. UPDATE: Below is actual transcript from speech given. Hello. I’m Truthful Loving Kindness. If I am a Person With Dementia, (PWD) and my brain is dying … what can I personally contribute toward Dementia Friendly Communities? … and how to make the most of the skills that are left. because … “Community” is made up of relationships. but it took 12 years before I got even a tentative diagnosis for dementia. … How can you personally apply that information in YOUR relationships? so do not assume that diagnosis means the next step is adult diapers and a care facility. … but acknowledge the fact that we have a lot of living before we get to end stage. 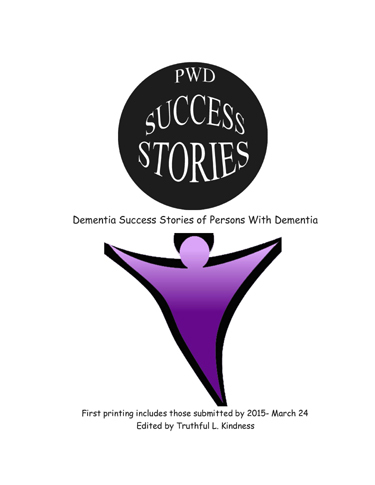 In order to emphasize that fact, my friends and I put together a booklet called “PWD Success Stories”. There are free ones over there on the table, and I see some over there too. They are free but this project is funded by my own wallet, so after you get done reading one can you pass it on to another Person With Dementia, or a Coach, or Professional. If you are a Person With Dementia (PWD) then I’ve got great news for you! There are peer groups ready to share their Lived Experiences in order to enhance this time in your life. I want to go home, where I belong. … I don’t belong here and can’t understand why I am here. These are the thoughts that go through your mind when you suffer from some form of dementia. … Your life is being forgotten. You look around and don’t recognize anybody or where you are. It doesn’t seem right and you just want to go home. The problem is, … I don’t remember where home is. Harry’s blog reminds me of my Daddy leading the way: When Daddy and I were walking in the night he held the lantern out to his side. That enabled Him to see a bit of the road ahead, and me to see a bit of the trail in between. This Dementia Trail is full of bumps … and tangles of thistles!! And thru our writings we can sign-post the dangers as we go, for those following behind. Coach and on-looker can observe and assist, but we on the dementia trail itself have a unique perspective. Someday there will be a cure, and we hope the trail will not last long enough to become a well-worn path. 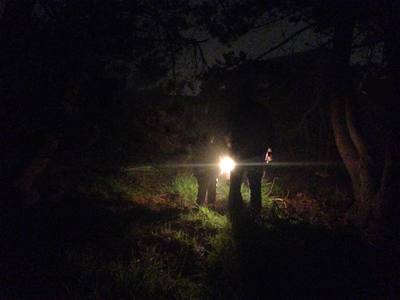 In the meantime we continue to shine the light on our trails by writing, or making video, … or speaking with groups. Have you ever had the feeling that you helped someone you never met? … I shed tears when I am able to help someone that has no one else to turn to. I call it my work but it is a GIFT given to me by this horrible disease I have called Alzheimer’s. Alzheimer’s has taken me to the darkest of places and I had to learn how to crawl out or be stuck there for the rest of my life. It is not just a social commitment or a part time endeavor; this is what I am supposed to do with my life. … Unless you walk the path, you have no idea. Harry is a motivator for writing in my blog, & was one of the founders for “Dementia Mentors”. I made this poster for Dementia Mentors, in memory of my two grandmothers who walked the Dementia Path before I did. “Since I learned from those who went before me & led the way, I do not dread what is to come. This is not a NEW path, even tho it is unfamiliar to me. 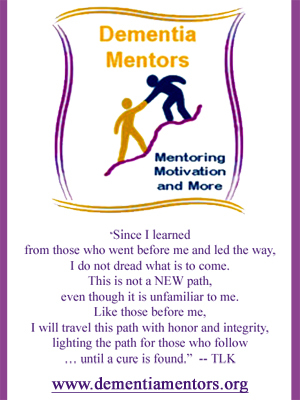 The peer group of Dementia Mentors is a primary support for me. It is not only something I “want” … it is something I need. After beginning the video chats on Wednesdays and Fridays, I turned to my husband and said, “You know what? Right now I FEEL normal; really I know that I am not – but I FEEL like I am. I have so much in common with my friends that during our chats … I AM normal!” Dementia Mentors are one of the resources listed in the PWD Success Stories booklet. 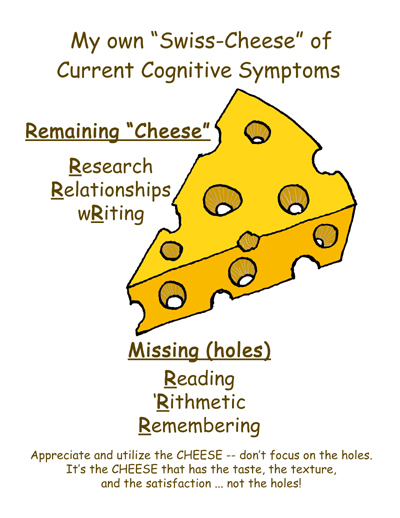 Back to my SWISS-CHEESE symptoms: My most intact skills are in Research, Relationships, and wRiting. In contrast, the biggest holes (where symptoms have removed my abilities) are in Reading, ‘Rithmetic, and Remembering. … My reading comprehension has now dropped from University-level to 4th grade. … My last job was in Accounting, but now I couldn’t tell you whether 44 was larger than 37. … And my husband says I often repeat the same question. I also have a hard time recognizing the way he looks, but I recognize his voice immediately. notice that the remaining skills allow me to maximize sharing of my Lived Experiences. What else? Another aspect of life after diagnosis is working on Dementia advocacy. We take the portions of our cognitive functions that remain and APPLY them to Awareness and Advocacy projects. 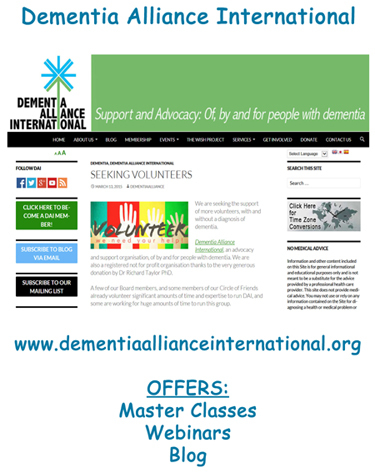 Dementia Alliance International (abbreviated DAI) is the formal non-profit organization that I look to for that area of my life and contact information is, again, in the booklet. It is also written here (pointing to overhead). I have been forgetting to cross things off as I went, so I have no idea where I am. Ummm — there it is! … completely by – and for — Persons With Dementia. We offer video & text support groups, but also it seems like it is geared to help train us as spokespersons to the world. I am currently in their groupings for Speaker’s Bureau and for Video, but there are several other outreach groups – again by and for the Person With Dementia. Recently World Health Organization collaborated with DAI on what they called “The Wish Project”, and Alzheimer’s Disease International also agreed to start collaborating with DAI as an independent international group of people living with dementia. … Okay … that is a lot to go on – for a Person With Dementia, but what if you are a person without dementia? What does this have to do with you? … or with “Dementia Friendly Community”? For one thing, request a speaker from the DAI Speaker’s Bureau. Blogs in order to see life from the perspective of Persons With Dementia. 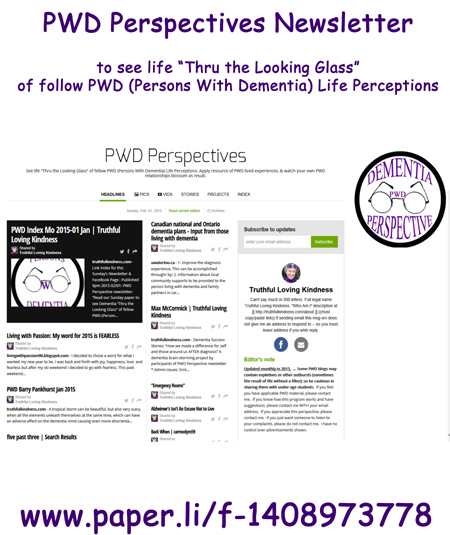 And that is why I started the monthly online newsletter of “PWD Perspectives”; to allow others to see life ‘Thru the Looking Glass’; from life perceptions of my fellow Persons With Dementia (or “PWD”). No revisions, explanations, or printing format is available with the newsletter; it is simply a collection of gathered links from what we write, or video, or artwork of Persons With Dementia; just like a search engine only it is in one place. I myself wrote a piece on Conversation Tips from patient perspective, which many have found helpful and I brought a few copies — over there (pointing to table). P … find your Purpose in life since your diagnosis. (2) I do not have time to die, I have too much to live for. Tommy Dunne posted it very concisely: Dementia has taught me that I’m here to do a job. It’s shown me that I still have a purpose & a duty to fulfill … before time runs out. You can see significant things are being produced. I think verbal and artistic produce from Lived Experiences of Persons With Dementia ARE able to contribute toward Dementia Friendly Communities. Despite our “Dementia” label – or maybe BECAUSE of that context, it is very important to value the product from our remaining cognitive abilities. One of the best ways is to listen to our words – truly LISTEN, not just wait and endure while we are speaking – not just quickly scan what we write. Instead reflect on our thoughts and art, so that you can APPLY that to your relationships. Time is up … Thank you very much for LISTENING ! * Admin issues: SHARE dementia awareness thru buttons below. If interested in receiving notice of future blog postings there is a “follow” button in the upper left corner (MS Explorer) or lower right (Safari and Chrome). Feel free to leave your thoughts in the form of comments, but please filter your comments with truthful loving kindness to all concerned. If there is an advertisement below, I have no control over what is shown. 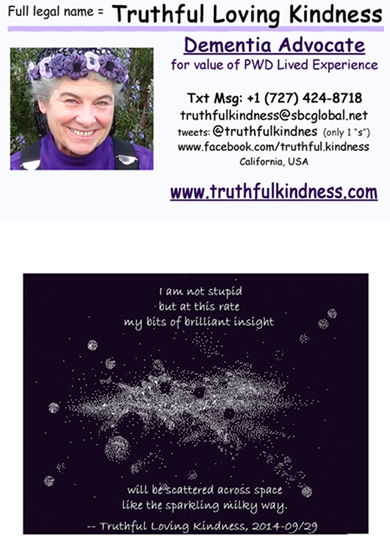 — Full legal name Truthful Loving Kindness copyright on 2015-03/15. 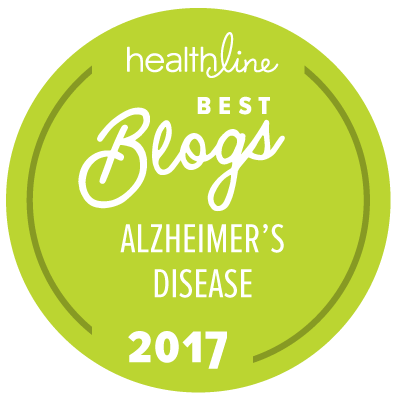 This entry was posted in Communication, Important, Journal and tagged alzheimers, dementia, dementia friendly community, lived experience, PLwD, Speech. Bookmark the permalink. True, you’ve really helped so many. Your attitude is wonderful. I’m so glad you can and will talk about your experience. Thank you. Is it possible to get a copy of your booklet you put together. It sounds wonderful? Thanks again for all the work you are doing to help shift our dementia care culture. Best of luck at ADI! Ask me how to get involved! Video -The Bald Chicken, Aging and Illness? Definitely; do you need sent this month, or is next month okay? Oh Truthfulkindness, What a wonderful presentation! I know you made every single word send the meaning of love and community while we are on this road. Thank You so Much! Once again, Tru, you have spoken with honesty and loving kindness! I wish I was there to hear your presentation. You have touched me in ways that are hard to describe…given me an understanding of the dementia journey and encouraged my compassion meter to elevate beyond what I had before connecting with you. Thank you for all your insight and your willingness to share your journey. Blessed wishes to you on the trip and your presentation! Know that you DO make a difference!! This sound great. Good luck and enjoy your time in Australia. Every time a person living with the condition called Dementia of what ever type speaks out, someone is educated. One person at a time, one day at a time change will come before the CURE. Spot on, Tru! Best of luck down under. I’m sure you will be great! In the UK watching and reading, your posts mean so much to me, and this presentation really is telling the truth about dementia without too much doom and gloom. I am struggling to come to terms with what is happening to me so hope I can pick up some of your positivity!